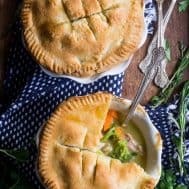 This Paleo Chicken Pot Pie has a delicious buttery flaky crust and creamy, savory filling packed with chicken and veggies. It’s the perfect comfort food for cold nights and can be made ahead of time too! Gluten free, grain free, dairy-free option and kid approved. I’ve gotten tons of requests over the past month or so for a chicken pot pie recipe – it’s like you all are mind readers, because I’ve been MEANING to make a paleo chicken pot pie since last winter – true story – but never got around to it due to the intimidation factor. 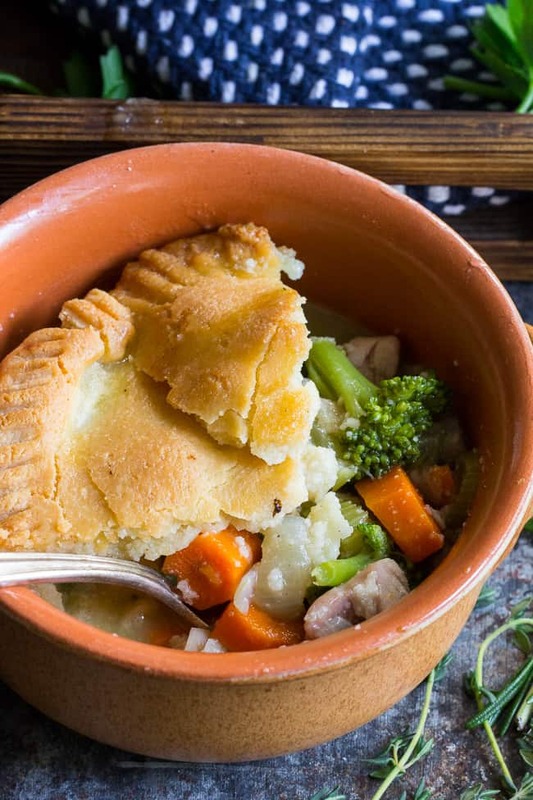 Chicken pot pie is a tall order, the ultimate of ultimate comfort foods, in my opinion, and, one of my favorite foods from childhood. The savory equivalent of a hot fudge peanut butter brownie sundae with cooking dough ice cream, AKA, the essence of what makes life worth living. I’m kidding (sure I am). But really, chicken pot pie is special, don’t you think?! And special meals require planning, focus, determination and follow through. 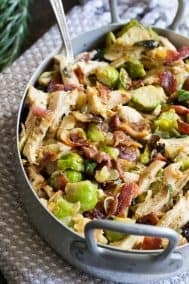 It didn’t happen last winter, but I’ve come around now – the ultimate paleo chicken pot pie, right here for all of you to enjoy! It all starts with the dough/crust. I based the recipe on my easy paleo pie crust, nearly doubling it and using a mix of organic palm oil shortening and grass fed butter for the fat. I love using a combination of both, but you can use all palm shortening OR all butter and get great results. I decided to make 2 smaller pies with double crusts (top and bottom) and one personal size pie with only a top crust to test both options. Both turned out absolutely delicious, so feel free to use only a top crust, and smaller dishes, if you want to cut down down on prep time or just don’t want so much crust in your pie. As for the filling, which is probably more important than the crust (?? ), I decided to go very traditional, only swapping out the typical peas for broccoli florets to make it “truly” paleo. 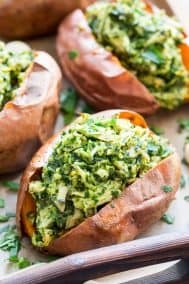 You can easily swap your favorite veggies into the filling without altering the recipe, so definitely take the opportunity to add whatever you and your family loves the most. For the chicken, I pre-baked boneless skinless chicken thighs, then cubed them, but you can use any cooked chicken you like – even a rotisserie chicken will work just fine. Once again, use whatever is convenient and family-approved to make this your own! The filling is given lots of flavor with onions, celery, carrots, broccoli, sea salt and pepper plus organic poultry seasoning. Simple but oh-so-good! So, what’s left? The creamy factor, right? We’ll be using chicken bone broth – either homemade or purchased – along with organic ghee or grass fed butter, tapioca flour (or arrowroot) as a thickener, and a small amount of coconut milk for that last bit of creaminess. The filling may or may not make more than you need to fill the crusts (depending on the size of your dishes) but any leftovers can be stored in the refrigerator and served for lunch the next day as soup. At least, that’s what I did with mine – YUM! Are you ready to get started? Let’s put our hearts and souls into this one 😉 Aaaaaannnnd – GO! 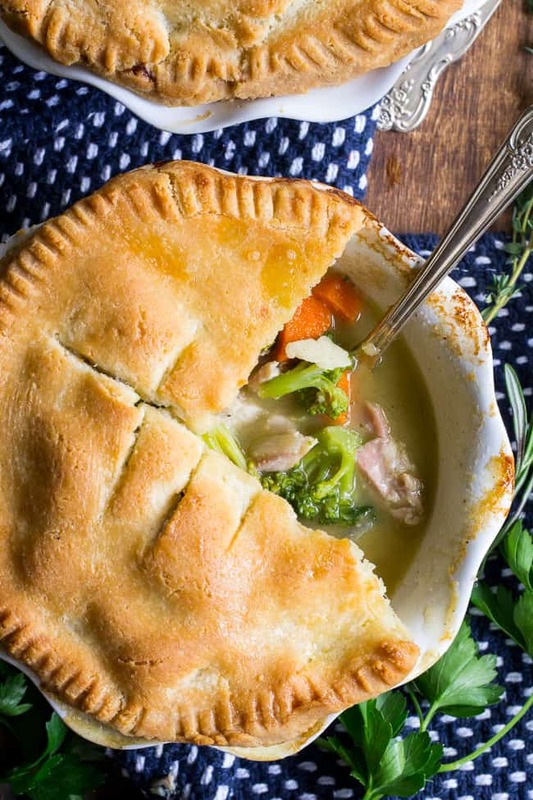 This Paleo Chicken Pot Pie has a delicious buttery flaky crust and creamy, savory filling packed with chicken and veggies. It's the perfect comfort food for cold nights and can be made ahead of time too! Gluten free, grain free, dairy-free option and kid approved. In a food processor combine all ingredients EXCEPT for the eggs and pulse until mixture resembles thick crumbs. Then, pulse/process in the eggs until a dough forms. Gather the dough into a ball prior to rolling or pressing into your pie dish(es). Separate dough into 4 disks and wrap tightly in plastic. Refrigerate for about 30 minutes prior to pressing/rolling out dough. Heat a large stock pot over med-low heat and add the 6 tbsp ghee or butter. Add the onions and celery, sprinkle with just a bit of salt and pepper. Raise the heat to medium and cook about 5 minutes, until translucent and fragrant. Whisk in the tapioca flour and continue whisking while the mixture bubbles for 1-2 minutes. Add bone broth and raise the heat, bringing the mixture to a boil while stirring. Once boiling, lower heat to med-low and continue to simmer another 10 minutes, until thickened. Once thickened, add the coconut milk, poultry seasoning, salt, pepper, parsley, cubed chicken, carrots and broccoli. Stir and cook another 1-2 minutes, then remove from heat and set aside. If using a bottom crust, poke holes all over crust with a pork and place pie dishes on a baking sheet. Pre-bake the bottom only for 10-12 minutes, or until bottom is just set, then remove from oven. Fill your pie dishes with filling almost up to the top (it’s fine that they boil over a bit while baking). Extra filling can be saved as leftovers for soup, or frozen for later use. To prepare the top crusts, roll or press the remaining disks between two pieces of parchment paper (or all of them, if using a top crust only) until about 1/4” thick. Carefully place top crust over filling and seal the edges as desired, then, using a thin knife, make 3 or 4 slits on the top crust. If using the egg wash, gently brush it over the top crusts and sprinkle with additional sea salt if desired. 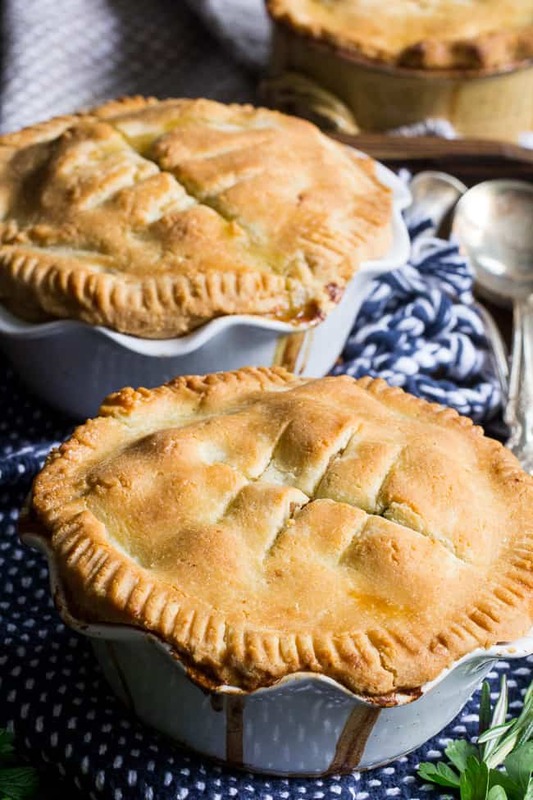 Place pie dishes on a large baking sheet (use 2 if necessary) and bake in the preheated oven for 30 minutes, until crust is deep golden brown and filling is bubbling through. **See this video for instructions on how to blanch vegetables. 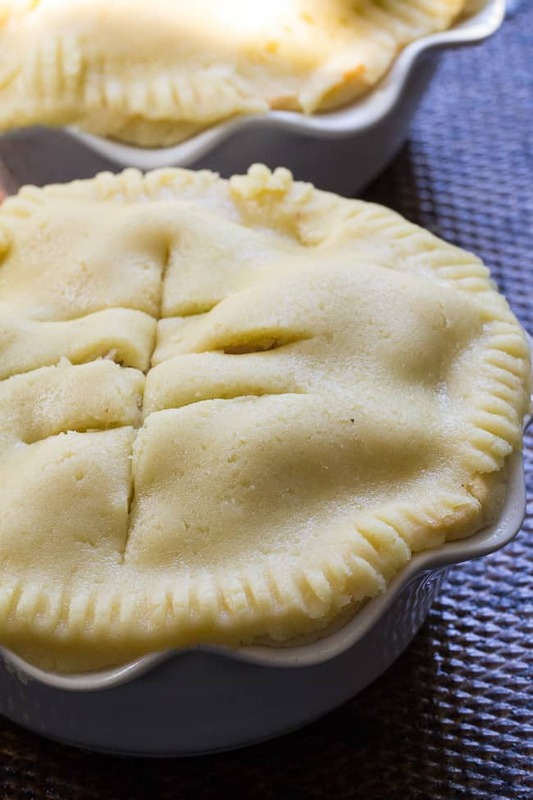 ***Press dough into bottom and sides of the pie dish(es) to fit - this dough will break easily since it lacks gluten, however it also repairs incredibly easily and can withstand a lot of manipulation without affecting the final product! Want More Paleo Dinner Ideas? Try One of These! Do you have a favorite childhood frozen meal? I was wondering that if you are using so many coconut products in your recipe, doesn’t it take on too much of the coconut flavor ? In a few of the recipes that I have made previously, the taste of the coconut (although somewhat subtle), just didn’t blend well with the taste of the dish. Considering this recipe makes about 10 servings there really isn’t much coconut in it, certainly not enough to take over the flavor of the dish. Which recipes have you made where you’ve noticed an undesirable coconut flavor? One tip I have is that for recipes with a lot of coconut OIL, use organic refined coconut oil instead of extra virgin since it’s totally flavorless. For a recipe like this one where there’s just a bit of coconut milk relative to the total liquid, you can simply omit it and replace with an equal amount of broth without sacrificing much of the creaminess of the filling at all. I have really enjoyed reading your recipes, and I was wondering what you would recommend for dairy-free for the filling instead of ghee or butter? For many of us with a dairy allergy, the milk fat in ghee is just as reactive as any other part of the milk. Hi! 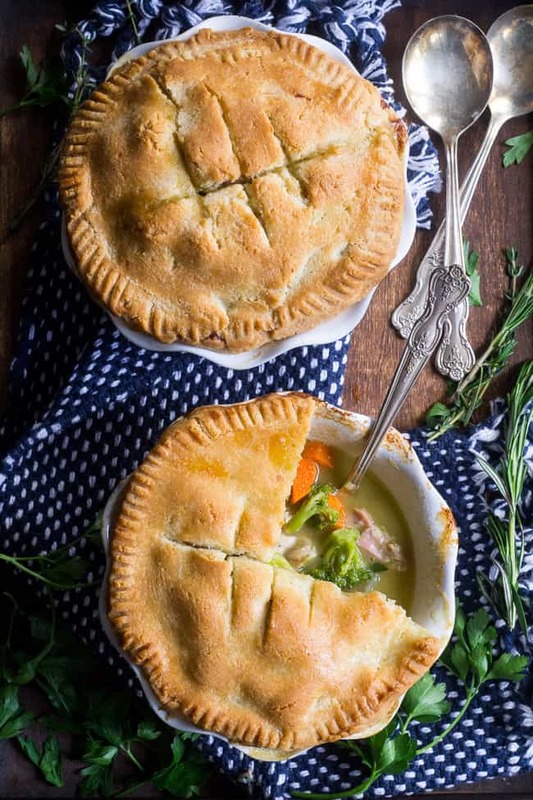 I can’t wait to try this because I’ve been looking for a way to make dairy free chicken pot pie. Can you find tapioca flour and palm oil shortening in a regular grocery store or do I need to special order it? Thanks! I order them on Amazon but I do know at least one of my local stores carries both, I’m not sure you’ll be able to find them in yours though. If you have amazon prime it’s worth ordering from them in my opinion! This was very good although it did take awhile to make. My crust was too gooey (I used butter instead of palm oil so I added more flour until I got the right consistency. Yes, it’s definitely a project 🙂 Glad you liked it! So good! I have a 4 1/2 and 2 1/2 year old and they both love this recipe (as does my husband). I add a little more carrots and celery along with a couple potatoes, and make in 2 pie pans with top only crusts. Yum!! That’s great! So happy you guys all enjoyed it! I was wondering if I could drop the filling into a 13×9 pan and use the crust recipe for one large square crust on top. I believe that would work well! I really liked this recipe! I ended up using individual pie baking dishes for a dinner party. One recipe of the filling fills six to seven, 5.5 inch dishes very nicely. I added a bit more onion, some garlic cloves and one half each of a rutabaga and parsnip in the filling. I used cooked Costco chicken meat and Kirkland bone broth. The crust tasted good and was not difficult to work with. Our menu included sautéed mushrooms, lemony asparagus and salad (all brought by dinner guests). Oh….and I made top only crusts for these pies. I halved the recipe for crust and it covered four pies nicely. The other pies were made with 1. wheat flour, butter and egg substitute; and 2. wheat flour, palm shortening and egg. That’s great to hear, sounds delicious! My family have voted this the best Paleo pie ever, and it will now have a regular spot on my revolving household menu 🙂 Thank you. How do you cook them if you freeze them..
You should be able to bake them from frozen – just longer of course, not sure of the time. So yummy! This is the BEST paleo crust I’ve tasted! It doesn’t taste gluten free at all. Thank you for a new favorite! Also, a question…have you tried making the crust dough ahead of time and freezing it? I would love to know if it works well. I nailed this entire recipe…until I got to the crust portion. For some reason I couldn’t transfer it from the parchment paper to the pie dish without it crumbling! I followed the recipe exactly, so I’m not sure what I’m doing wrong! Both times the crust completely started to crack and crumble when I tried to transfer it. I even tried adding water, thinking it was too dry – but nothing! Put the rolled out crust in the fridge or freezer until it’s firmer and then tip it on to the pie 😁. Works for sweet pies too. I made this tonight and IT IS AMAZING!! Thank you for this! Allergic to nuts- what flour can i use?? This is so flipping good!!! I can’t believe that it tastes EXACTLY like regular chicken pot pie! I’m definitely using this crust recipe again! 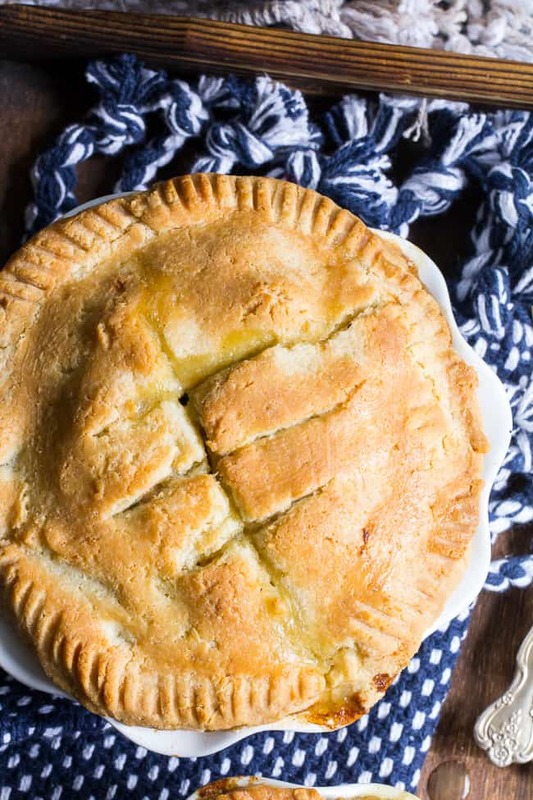 The best pot pie recipe I’ve ever tried! I used turkey breast from a roasted turkey I made the night before. Made my own turkey bone broth for this recipe. Amazing. I didn’t have celery on hand so I substituted with zucchini and squash. So thrilled you all enjoyed it! This recipe is a winner. I put the filling in a rectangle baking dish and laid the crust on top. It really doesn’t taste paleo. So delicious!! Has anyone tried this recipe with an egg substitute for the 2 eggs in the crust? My client requested a gluten free, grain free chicken pot pie but also cannot have eggs. I was going to try flax eggs but would love to know if someone else has tried it.